The tremendous George Bellas (ex-RING OF FIRE / ex-MOOG-WAY) belongs to the second generation of Guitar Shredders, along with Derek Taylor, Jeff Kollman, Toby Knapp or Tony Fredianelli, this spontaneous breed was once again initiated by the guru Mike Varney already responsible for the first wave that ravaged the hope of many players back then, indeed with his first attempt in the mid-80s to bring to the incredulous world some amazing six strings prophets like Yngwie J. Malmsteen, Tony MacAlpine, Paul Gilbert, Joey Taffola, Marty Friedman and of course Jason Becker, that was highly successful and metamorphosed the face of the Guitar world forever. Mr. Bellas was signed to the mighty Varney’s team at Shrapnel Records in the 90s and immediately became the new young god in the small community of hyper fast picking worshippers, one of the most sought after hired guns for the guitar aficionados and toward the larger audience he was one of the new in vogue hot-player, and soon, he released a bunch of solid records with Vitalij Kuprij, Mark Boals or John West, and obviously the big breakout when he was chosen by Phil Moog and Pete Way to replace the axe idol itself: Michael Schenker… It was way before Vinnie Moore stole the crown and reached the UFO booth spot. Now the third and even the fourth generation is armed, ready, angry and climbing reaching for the spotlight , the kids are mesmerized by young wizards like Andy James, Paul Wardingham, Christian Muenzner or Tosin Abasi, so the endless fighting quest for 'the pick of destiny's hegemony' is still raging. I will be honest with you, I believed that George Bellas was walking a dangerous path with some low key sounding releases in the 2000s as the “Venomous Fingers” or the “Planetary Alignment” but luckily since 2009 and the publishing of the stellar ”Step Into Future” the maestro was heading another time in the right direction straight to the milky way up high. 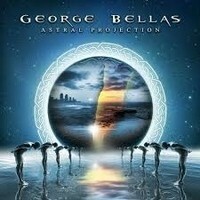 This album was a pretty difficult disc to stay focused on, because it was composed by one and only one huge song, this time for “Astral Projection”, as it was for 2010s highly praised “The Dawn of Time” the strategic is quite the opposite, with fifteen relatively short cuts embellished by many deep orchestrations (“On The Other Side”) but with a barely seen intensity. Strangely, I think this album could be considered as an even more secure move (“Fabric of Space and Time” / “Tipler’s Cylinder”), with some melodies more easy to swallow (“Hyperspace”) and a few friendly themes (“Out Of Boby”) but, don’t get me wrong this disc isn’t for everyone still (I mean it’s not “Surfing With The Alien”), it should be reserved for the elitists, the fret boards nerds and the symphonic Metal geeks with the intellectual desire to dig deep and to ponder over things (“Rip The Continum”)… I’m a proud member of that fellowship. Seriously it deserves a little longer than your daily listening routine, because, the absolute high classical inspiration (“Apparition”), the bold unadulterated intellectual meaning and the sheer frenzy of notes could have been a block for most of the Metal Temple readers, indeed the average Metal fan will probably have a little hassles to finding the will and the time required for one complete listening session (“Heightened Awareness”). Following the new rules sated several years ago in order to evolve , still raising new goals and keeping an interest in writing challenging new material , he transcend his way to conceive/play/compose and release his music , with the help of Lion Music records he found a new angle for a more cerebral writing and forgot about the traditional instrumental guitar sounds used by fellow axemen for a more symphonic approach (“Into The Unknown”) or a synthesized atmospheric mood ornamented with ambient progressives lines (“Transcendental” / ”Interdimensional Travel”), a stylistic eclecticism embellished with still a few ferocious vertiginous scales here and there, but the sole center point is clearly now about composition and textures (“Visiting An Alien World”) and not anymore about technicality or skills. However, his Jaw-dropping speed technique and tone is still flawless, everything about chops, feel and virtuosity here is perfect, only matched once again by the participation of Drummer extraordinaire: the furious Marco Minnemann (THE ARISTOCRATS / ex-NECROPHAGIST) which provide a fierce dynamic percussion performance, a full blasting pattern (“Magnetic Anomaly”), as a strong counterpart to the flurry of burning strings skipping licks provided over and over again in a relentless way by Mr. Bellas (“Dimensional Portal”). ….So you’ll be warned more than once, it’s up to you, this collection of instrumental tracks reveal a real undisputed artistic direction yet , for some it could be perceived as aseptic with an inaccessibility like static atmosphere (“Curiosity”), without any emotional involvement, for my part I proudly enjoy this up lifting, smart, futuristic super-shredding wave of emotions… I know, I blow hot and cold with such an ambiguous review but I truly stick to the fact that with such a complex music as subject, the text should reveal the turmoil of this recording rightly named “Astral Projection”: A future Underground classic.